NEW YORK—Not even a superstorm can put a damper on Manhattan’s real estate market. The Financial District was crippled for weeks after Superstorm Sandy causing city, state, federal, and private resources to be poured into stormproofing efforts. But as time passes, it seems what’s out of sight is out of mind. Adie Kriegstein, a CORE real estate agent, said that a recent condo buyer started her search in Battery Park and then the Downtown area. Kriegstein said that her number one concern was: how did the building fare during Sandy? Ultimately, the client went for affordability. “Out of everything, she bought in the Seaport,” said Kriegstein. The area has some of the oldest buildings in the city and bore the fury of the storm surge that hit Manhattan. Although the building lost electricity and the lobby flooded during the storm, no stormproofing efforts were made afterward. Kriegstein said for those looking to buy real estate in New York City, concerns over future storms are not top of mind. “Price per square foot often trumps all,” said Kriegstein. The passage of time also seems to dim the memory of damage done. In Kriegstein’s experience, there were buyer concerns for about six months after Sandy, but they subsided along with the visible damage Downtown. But even when the storm first hit, prices weren’t affected, according to Pete Culliney, director of research at CityRealty. After the storm, Culliney got requests to look at his numbers in the aftermath for drops in prices, people leaving the area, et cetera. Culliney noted that at 250 West St., a building that had been three-quarters in contract before the storm, was expected to sell out before the end of the year. Then the storm hit. Electrical equipment was damaged because the basement flooded, but the lobby was fine. There were worries the pricing would suffer afterwards, but all of the contracts were closed after the storm and the rest of the contracts were snapped up without a discount, Culliney said. Living in Manhattan is costly, and so is moving a building’s mechanicals from the basement to the top. With dozens of residential buildings in progress, the influx of residents in the Financial District, and the memory of Sandy still fresh, one would expect stormproofing to be worked into new developments. Many developments did work the preventative measures in, and it has a lot to do with the types of buildings going up in the Financial District. “It comes down to the haves and the have-nots,” said Culliney. For example, the residential complex at 2 Gold St. and 201 Pearl St. were badly damaged by Sandy. This spring the owners installed a 13-by-11 foot $250,000 flood-proof door with nitrogen-fueled gaskets to protect their basement. Other buildings have taken measures to get the electrical equipment from the basement to higher levels. If anything, prioritizing preventative measures is increasing property value. “Sales prices and the number of closings have increased significantly in the past year and there is over a dozen new residential developments in the works in the Financial District alone,” said Ariel Cohen of The Ariel Cohen Team at Douglas Elliman. The demographic downtown is younger than that of Midtown, and price per square foot is still considerably lower. The current mutually-beneficial trend of residential and retail is causing the area to thrive as well. Over the past year, according to the Real Estate Board of New York’s Fall 2013 Retail Report, the Financial District saw the greatest increase in price per square foot at 69 percent, but is still far, far below the price of other neighborhoods at $257 per square foot. The Fifth Avenue Corridor saw an 18 percent jump from last year but holds its top spot as the most expensive with an average rent of $3,170 per square foot. Companies’ concerns vary a bit from residential. According to developers, Sandy brought up the issue of being able to provide spaces that can withstand business interruptions. Con Edison was not prepared for the storm and buildings with basement-level generators were out of power for a long time. Along with a reduced workforce, the connectivity of Con Edison’s grid had issues according to a utility workers union report looking at Sandy damage. Silverstein Properties, one of the largest developers downtown, touted its continuity plan after the storm. Tenants at 7 World Trade Center and 120 Broadway were able to return to their offices a few days after the storm. Jeremy Moss, Silverstein’s vice president of leasing, had stated the strategy was an expensive and time consuming effort that takes away from their core business, but sent a clear message business continuity was their priority. Transportation adds value to real estate as well, and with the Fulton stop changes underway malls like Westfield and Brookfield have signed on to the area. Westfield has been quiet about their leases, but Brookfield has announced tenants including Theory, Burberry, Hermes, and Salvatore Ferragamo. Conde Nast is headquartering in 1 World Trade Center along with the The U.S. Army Corps of Engineers, U.S. Customs and Border Protection agency and the federal General Services Administration. 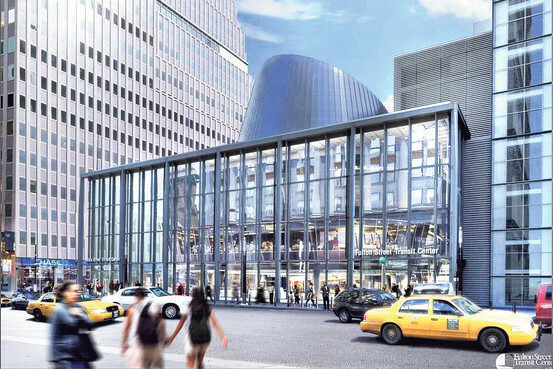 Media company GroupM signed on as 3 World Trade Center’s anchor tenant recently as well. Post-Sandy, the city directed a lot of attention and eventual funding to resiliency. Architects and designers are taking the issue into consideration as well, and some say the efforts aren’t looking long-term. Two years before Sandy, the Museum of Modern Art and P.S.1 Contemporary Art Center put together the “Rising Currents” exhibition with plans from five interdisciplinary teams. The project addressed the rising sea levels that will eventually diminish the amount of land along the waterfront. The stance the designers took was largely that infrastructure should allow the water to come and go–infrastructure that would probably change the value of property levels, as they included ideas like wetlands, hanging structures. Some parts of the city are already below sea level, like Chelsea where Kriegstein has sold real estate there for eight years. Unlike the Financial District, the visible damage was minimal so she didn’t hear the same concerns from buyers in Chelsea post-Sandy. “Property values keep going up and up—some of those buildings that were worst damaged have had bidding wars on the apartments there,” said Kriegstein.